Wokefield Park is tucked away in a peaceful and picturesque corner of the Berkshire countryside. The golf club is complemented by a range of on-site leisure facilities and there are plenty of local places of interest within easy reach of the centre. 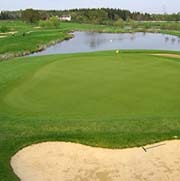 Designed to US PGA standards, the 6996-yard championship course at Wokefield Park boasts 18 uniquely designed holes with elevated tees, mature trees, streams and nine lakes providing a challenging game to golfers of all standards in a beautiful setting.